Though we had unofficial counts after last week’s recall election of Chairman Cheyne and Zone 1 Representative Smith, the Klamath Irrigation District came to a consensus on Monday, October 17th, to count and confirm the results. Representative Ken Smith narrowly avoided recall with a 52-51 vote. However, in an 89-77 vote, KID patrons decided to recall Chairman Cheyne. Though the KID Board of Directors has confirmed the ballot counts, at this point it’s unclear when the recall elections would be considered official. It appears results of the election would need to be reviewed by recall election counsel. Plus, while two of the KID Board member recall elections have occurred, the final one for Vice Chairman Knoll has yet to take place. That recall election will take place on November 7th, 2016 from 7 am to 8 pm at KID offices. We couldn’t agree more, Ross. 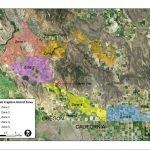 If you’ve spent much time in the last few weeks reading the letters to the editor in the Herald and News, you’ve seen Klamath Irrigation District (KID) Chairman Cheyne, Vice Chairman Knoll and board member Ken Smith’s most ardent and vocal supporters arguing not only are these three men not pushing an agenda, they’re merely doing what they were elected to do, including hiring outside help to negotiate the C Flume contract. These folks have also stated this recall effort against these “honest” men is merely sour grapes from former board members and, therefore, has no merit. Regardless of their view of the Board majority faction, the truth looks much murkier. In Mr. Knoll’s Letter of Justification he called out the public records requests as distraction tactics being used to disrupt district business. However, in the request for lame duck Klamath County Commissioner Tom Mallams‘ emails, we’ve found several emails which, in our opinion, are troubling for KID patrons. Not only do these emails call into question who exactly Larry Kogan was working for, in our opinion, we feel they call into question Chairman Cheyne’s leadership in allowing outside, non-KID forces to have a voice in district decisions. This email counters Chairman Cheyne’s claim that Larry Kogan was found from a “Google search”, as he publicly stated at a KID board meeting. This email from Joe Watkins of the Klamath Soil and Water Conservation District on December 19th, 2015 (which includes Cheyne, Knoll, Tom Mallams, Senator Doug Whitsett and KID patron Pat Lunde in a forwarded email from Kogan), to us clearly indicates that Kogan was already working with Cheyne and his associates, requesting Watkins to share an attached document “with the irrigators”. This raises the question of how Mr. Kogan came to our Basin, which wasn’t likely due to a “Google search” initiated by Cheyne. Read this email. In this email, Chairman Cheyne forwarded Vice Chairman Knoll a message from Senator Whitsett (who is not a KID patron) which included an attached revised Mission Statement, an Explanation of the Mission Statement and a KID Newsletter with Whittsett’s comments. The three documents suggest that a plan – prepared by or with Senator Whitsett’s assistance – to create a mission statement for KID that would give KID justification for not joining organizations not aligned with the mission statement (e.g. KWUA). This happened around the time that dozens of pro-KWUA patrons started showing up at the KID board meetings, which may have been the reason the mission statement and accompanying newsletter were never publicly introduced. Importantly, Senator Whitsett is listed as the “author” of all three attachments, when you check the properties of the document. This email begs the question of why Chairman Cheyne was getting advice from a non-patron, versus KID’s legal counsel. Clearly Chairman Cheyne was allowing a powerful elected official – often adversarial to KID’s past policy positions – to form policy for that same district, now controlled by his allies. Read this email. In this same email, Kogan goes on to tell Cheyne, Knoll, Mallams, Ryan and Linthicum that he feels KID’s lawyer Reitmann (also Mallams’ attorney) “has intentionally deceived or incompetently (due to his short legal practice experience) deceived you into believing it can all be worked out”, and “effectively works for the other team (BOR)”. In Kogan’s opinion, the board needed to “terminate Reitmann and permit me to do my job if you want the District to have a fighting chance at coming out of this positively”. The internal bickering of newly hired KID attorneys is certainly disturbing, especially since KID patrons are paying the bill. What this also demonstrates is that Kogan was sharing the inner-workings of KID with outside, non-KID influencers. Kogan was clearly sharing client information with these people – who were not paying his bill. Read this email. Larry Kogan has again emailed California Representative LaMalfa’s staffer Erin Ryan, Tom Mallams, Dennis Linthicum and Doug Whitsett about KID affairs and included a press release about the KID Board of Directors Special Meeting. The press release, dated March 31st as well, delves into the topic of the meeting (the C Flume contract) and the documents prepared by Reitmann and Kogan. Once again, Kogan is sharing information with four people who are not KID patrons, and whose interests are not those of the patrons. Read this email. Kogan emailed Chairman Cheyne, Dave Cacka, Greg Carlton and Nathan Reitmann about the C Flume Contract and the associated documents. While this is appropriate, the fact that he blind-copied Tom Mallams on this raises more questions. Did Chairman Cheyne direct Kogan to Bcc Mallams in on this, or did Kogan do this all on his own again? Read this email. These emails, in our opinion, provide further evidence why Chairman Cheyne, Vice Chairman Knoll and Mr. Smith need to be recalled. We believe they suggest that the Klamath Irrigation District Board majority were active participants in a political gambit led by outside interests with an agenda contrary to the well-being of KID. There is no reason why Attorney Kogan was emailing Mallams about KID business, which we believe is a breach of client-attorney privilege, especially when considering Mallams’ conflict of interest relative to KID groundwater rights matters. Were Cheyne, Smith and Knoll aware of these emails? If so, did they direct Kogan to send them? 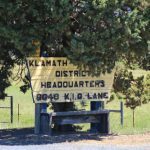 On Monday, October 3rd, Klamath Irrigation District Vice Chairman Grant Knoll submitted his Statement of Justification to KID office manager Linda Seater. In his statement, Knoll went on the offensive, focusing on his election win record before addressing the “baseless accusations”. 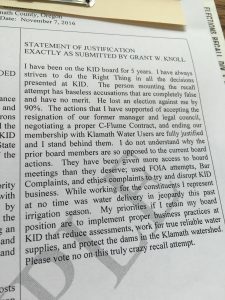 In the October 5th Herald and News article, “KID’s Knoll justifies board participation“, Vice Chairman Knoll went on to explain he feels the KID board has “outdated” bylaws (which a committee was formed to address already), and new work rules, financial policies and employee descriptions need to by updated as well. He also went on to explain his position on dam removal, which from what we can tell does not effect KID patrons since the only dam in Klamath County is near Keno. In reference to Knoll’s 90% victory, for that election there was only a 30% turnout – hardly a mandate against Mr. Chapman. While we can appreciate Mr. Knoll’s ability to look forward and see what KID needs to address to continue operating, why haven’t those issues been addressed in his last five years of service to the Board of Directors? 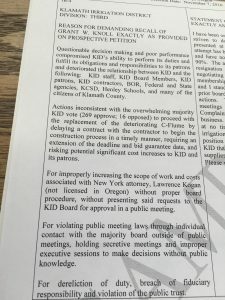 Are the patrons not justified in the opinion that wasting nearly $130,000 on New York City attorney Lawrence Kogan to “negotiate” (which apparently means not to change a word of a document) the C Flume Contract while the legal budget spirals out of control? We still have the issue of approving the funding for the C Flume contract, and then standing in the way of signing the contract with R&G Excavating to get the C Canal Flume replacement started. As far his concerns about the need to use the Freedom of Information Act to obtain information, perhaps that wouldn’t need to be an issue if he, Cheyne and Smith were more transparent and honest in their work for the board. And hiring an attorney that’s not licensed in Oregon and another that represents a party that is working against KID patrons’ interests would result in a Bar Complaint. They have been given more access to board meetings than they deserve . . . . In our opinion, that comment justifies our push to recall Vice Chairman Knoll even more. The fact he feels only some patrons should be given access to meetings speaks to either arrogance or an agenda he, Cheyne and Smith are hellbent on pushing. Does he feel Commissioner Tom Mallams and State Senate candidate Dennis Linthicum – who are not KID patrons – should be allowed at these meetings and not former board members or those who oppose his various positions that appear to have a negative effect on KID patrons? Vice Chairman Knoll may feel this is a “truly crazy recall attempt”, but that doesn’t change the facts and issues we have addressed. There have been bad decisions made by him, Cheyne and Smith that are going to impact KID irrigators for a very long time. Some of these decisions have been very expensive – and irresponsible. Apparently the hits don’t stop coming for Klamath Irrigation District Board of Directors Chairman Brent Cheyne and Director Smith. After receiving a complaint alleging campaign financing violations, the Oregon Secretary of State Elections Division (SOS) sent letters to Chairman Cheyne and Mr. Smith along with a letter to KID patron Al Fronsdahl about the political activities surrounding the opposition to the KID recall elections. In it, the SOS asked specific questions regarding campaign finances, expenditures and contributions. The SOS requested a response date no later than October 7, 2016. As we get closer to the October 12th recall election of Chairman Cheyne and Director Smith, these issues remain important. If they are involved in the actions the SOS is investigating, it shows even more reason why these two men need to be recalled. Aside from the obvious disregard for KID’s legal budget, the odd manner in which Kogan came to KID, the fact they stood in the way of the C Flume contract, or even the questionable decision to hire an irrigation district manager with no experience, these two continue to push their personal agenda over the needs of the irrigation district and its patrons. Not only is it embarrassing they’re so nakedly pushing their own agendas, it’s dangerous. For more details, read the press release “KID Recall Opponents Questioned by Oregon Secretary of State“, the Oregon Secretary of State’s letter to Chairman Cheyne and Mr. Smith, or the letter to Mr. Fronsdahl.